Today I’m diving into a cigar made by the very popular A.J. Fernandez. AJ’s cigars and me seem to have a love and hate relationship. There are some that I absolutely enjoy and some that are just not quite my profile. 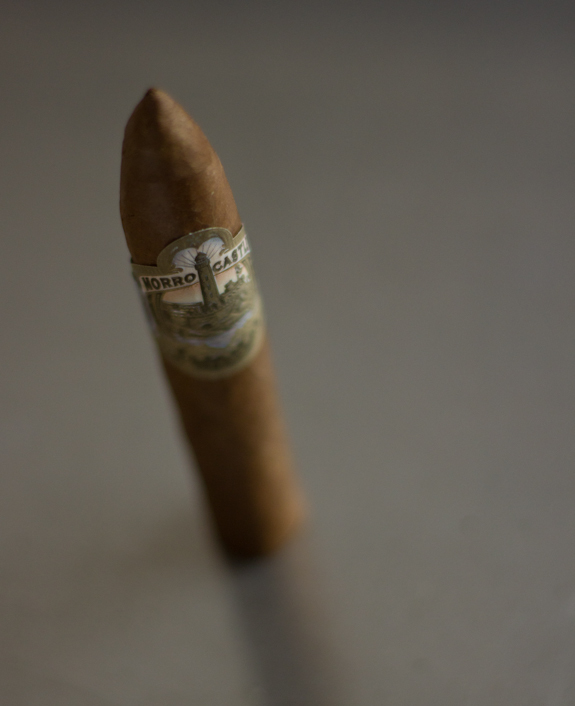 So today I’ll be lighting up a Morro Castle Belicoso and see where the next A.J. Fernandez cigar lines up in the review bank. Now let me just toss this out there.. One thing I’m not happy about when it comes to AJ’s cigars is the restricted distribution and sale of most of them, namely through cigar.com and all it’s affiliates such as cigarsinternational.com. I don’t have a problem with those retailers, but they seem ot have a problem with the awesome people North of the border since they don’t ship to Canada. So needless to say, they are more difficult for me to get my hands on. This also affects a lot of people who prefer to purchase cigars from local B&M’s. 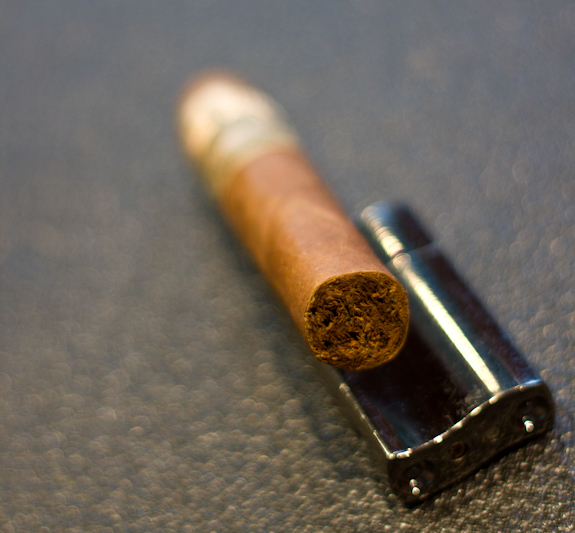 Ok, so now that we got that out of the way, what else do we know about this cigar. 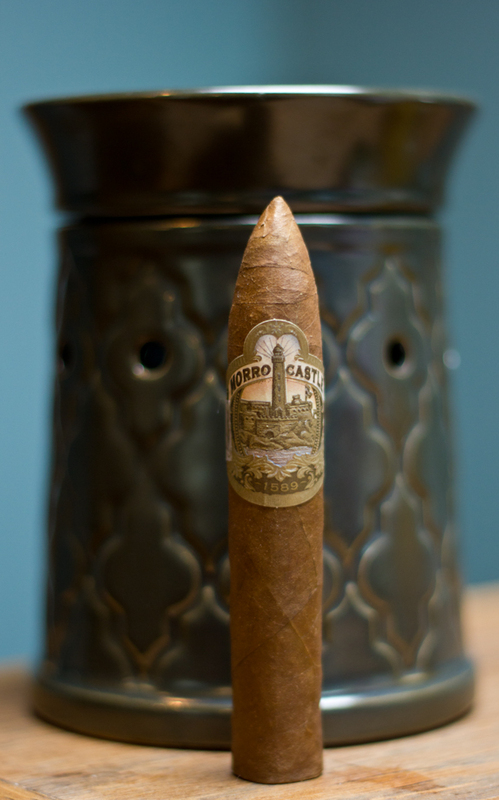 Well, the Morro Castle brand actually has roots in the Cuban cigar industry but A.J. 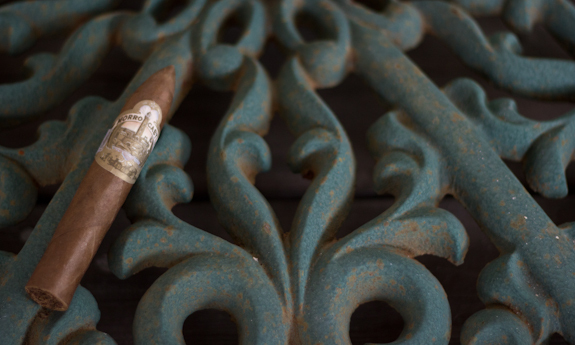 Fernandez took ownership of the brand and began blending and manufacturing them in Nicaragua. He also gave what seems to be a throw back to the original heritage by using some Cuban seed leaves in the filler. I stated the MSRP below as being $5 but if you get them by the box and catch them on sale, they can actually be had for prices well below $4 per stick in the Belicoso vitola. Other available vitolas include the Robusto, Toro, Torpedo and Churchill. We have quite a few other reviews from AJ’s massive resume on the site as well, some of my personal favorites include the Man O’ War Armada, Man O’ War Virtue and a more recent popular cigar that Tony reviewed, the San Lotano Oval. So I think this cigar has a lot to live up to and hopefully it’s lower price will give it a slight edge in the final thoughts section. I received most of my samples through trades and/or gifts, the cigar I’m lighting up today comes from a trade made this past Christmas, let’s see how it stacks up! •	There is a bit of sweetness sneaking into the mix too, maybe like a roasted nutty caramel type of profile, very interesting. •	The earthiness is still lingering and the finish has changed from the dry start to a creamy sweetness, much, much better! I think it’s pretty easy to tell that I wasn’t a fan of the first inch of this cigar. That bitter dryness is not a great way to make a first impression. But I’m glad to say I stuck it out and kept going because this turned into a pretty good quality cigar. It had a nice array of flavors and the burn was damn near perfect. When you factor in the price you can get these at by box purchase, it makes them a worthwhile purchase. I had a few in this vitola and they all seemed to suffer from bad starts so if I were to purchase them again I’d probably opt for a larger vitola to get more of the sweet spot in the experience. I took a bit of a risk with this pairing today. I’m no Lambic aficionado like Tony, but from the few I’ve had I know that they are very sweet and usually flavored with some sort of fruit such as raspberry or cherry. 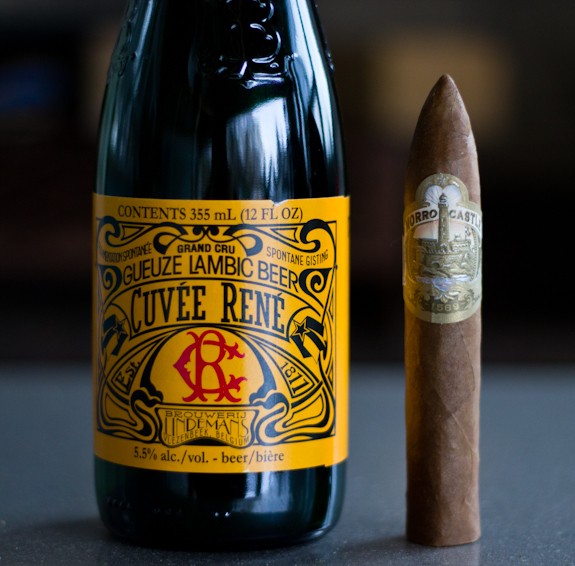 They are tasty, but probably not a great pairing for a cigar. So I found this lambic that doesn’t seem to be flavored, I knew it was going to be sweet but I hoped it would still work out. It’s from Lindemans brewery in Belgium and is called the Cuvee Rene. So it is sweet, but not nearly as sweet as their flavored offerings and it’s got a fair bit of carbonation. Surprisingly though, it seemed to work well with a cigar, especially one with a bit more body and a touch of spice to counteract the beers sweetness. It’s sort of hard to describe a lambic beer but I guess you could compare it to an alcoholic version of pop. This particular one has some citrus notes to it so maybe like a delicious and alcoholic version of 7UP or Sprite? I’m probably way off but that’s what I think, lol. 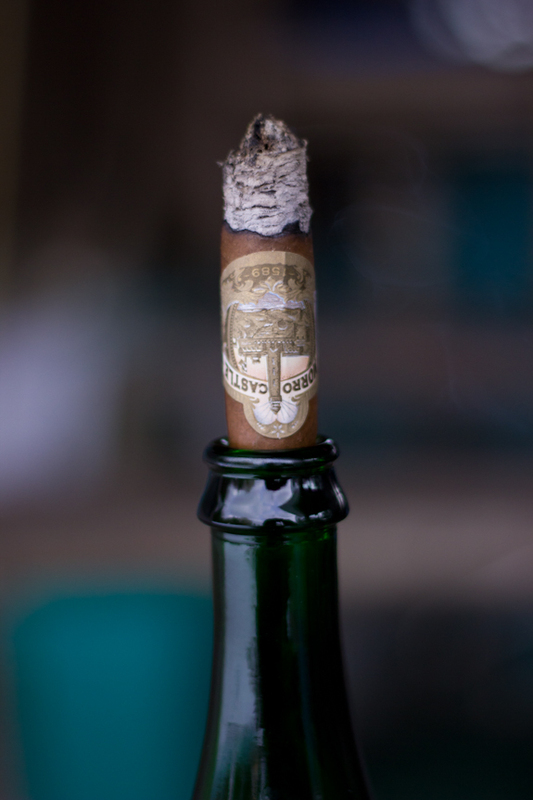 Either way, it was tasty and went well with the cigar. Other options for the Morro Castle would be a porter or dark ale, maybe a strong coffee and even some black tea. Excellent review and pics Daniel. Isn’t funny, the name Cigar International………………. …….INTERNATIONAL???? but we won’t ship next door. I can only assume that they had so many returns due to customs they felt it wasn’t worth their time. It’s understandable but also dissapointing. At least we have so other guys willing to ship Northward. Looking forward to trying the Morro!! Thanks again buddy, looking forward to the next herf! Awesome review dude! Cuvee Rene is my favorite brew by Lindemans! Good work. 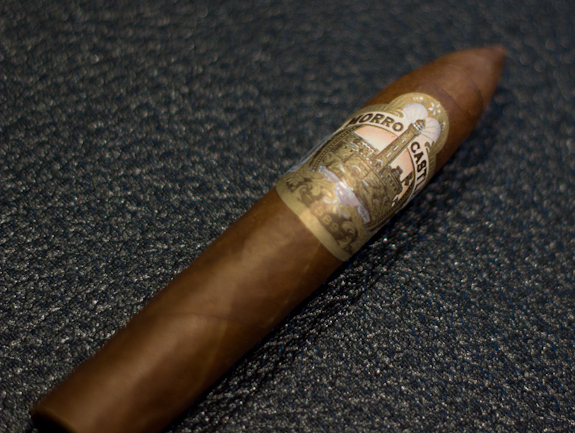 I had a couple of these belicosos several months back, and I recall them being a pretty decent smoke, especially considerering the price I got them at. I do have a couple of coronas that came in an AJ corona sampler. I’m looking forward to seeing how they are in that vitola. Jeff, I’d be curious to hear if you had bad starts on yours? Or did I just have bad luck? If the corona would be in the sweet spot the whole time it would be an awesome smoke. I definitely need to try a torpedo or toro, I think I would really enjoy that. Daniel, I don’t recall having a bad start on the belicosos, but then again, at my age the memory ain’t what it used to be. I had intended to get some torpedos to try, but I kept getting outbid, and then they fell from my radar. Well Daniel, I tried one of the coronas today, and I must say it wasn’t such a great experience. I did get that bitterness that you got early on, and a lot more pepperiness ,with little of the smooth sweet woodiness and light coffee/cocoa I recall in the ones I had earlier. I don’t know if they changed anything in this line, or whether it’s just the typical inconsistency of CI exclusives, but the other one I have will have a nice long rest. I’m not sure I’ll be tempted to buy these again, but maybe if I could get the larger size cheap enough where I could cut off the first third before lighting up lol? Great review DT! Digging the Belicoso size. Great review of this cigar line. 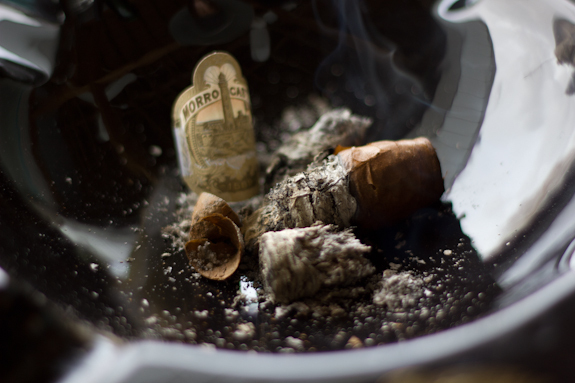 The first Morro Castle I had in a sampler,robusto, was a great cigar with that carmel \nutty flavor that you enjoyed. So I bought two five packs and these sure don’t seem like the same cigar I enjoyed. Just a woodly, mildly spice flavors. I might have to pick up a few in the size that you enjoyed and maybe that is the sweet spot for the Morro Castle line. In the meantime, I am aging my robuto sticks hoping to improve the flavor. Hopefully aging helps them out a bit! Thanks for the comment Sticks! Dan, This is one of my favorite AJ blends. I picked up a box of the Churchill’s on cigarbid for $31. Great investment. I agree with the assessment that sometimes the Fernandez blends can be hit or miss, sometimes within the same line, but I these are becoming one of my regular rotation sticks. Great review, appreciate the information on the pairing as well. Might have to at least try a lambic just to see what I think.